Successful organizations thrive, while others get trapped in silos and miss oportunities. 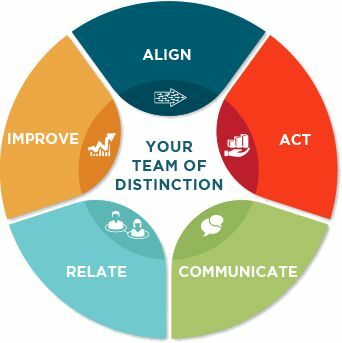 Our scientifically validated team model will give you insight into how to achieve your strategic business goals by aligning your people to execute faster, better. To validate the model, data was collected from a total of 577 professionals. The reliability coefficient ranged from .84 to .98, indicating a very strong and reliable model. Validation reports available upon request. ALIGN: Strengthen alignment of mission, goals, roles and responsibilities. ACT: Create a culture of accountability. COMMUNICATE: Establish open and productive meetings and communication channels. RELATE: Build a supportive team community that celebrates success and proactively helps others. IMPROVE: Resolve conflict positively and promote self and team improvement. Since 2008, over 30,000 professionals on 5 continents have profited from our team-building and executive coaching programs. Our customers say they receive a 200%-6,600% Return on Investment from applying our proprietary methodologies. One reason for our success is that our Team Consultants are all experienced leaders. They personally understand what it takes to lead teams and create swing. Their counsel is practical based on real world experience.